The affordable Acer G226HQL display is one of the most affordable Full HD 1080p monitors, making it an ideal option for those with a tight budget. The modern and attractive slim design with narrow bezels makes the monitor look more expensive as the picture pops out. As expected at this price point, the monitor doesn’t offer any extra, fancy features but several common ones, which is acceptable as the crisp 1080p image quality is more than satisfactory. 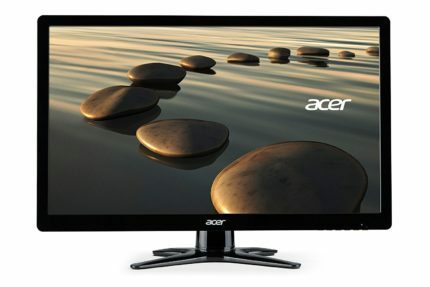 The TN panel of the Acer G226HQLBbd PC monitor delivers a quick 5ms response time which is enough to eliminate ghosting of fast moving objects in the everyday use of the computer and even in some fast-paced video games. Although modern TN panels are capable of 1ms response time, at this price point 5ms is plenty, and the difference between the two is barely noticeable. One of the drawbacks of the TN panel monitors are the viewing angles. The Acer G226HQL 1080p screen has 160-degree viewing angles both horizontal and vertical meaning that if you wish to watch the monitor at a different angle, you will have to tilt the screen to the appropriate angle in order to enjoy the picture in which the colors don’t lose their tint. 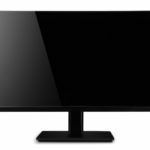 The static contrast of the Acer G226HQL amounts to 600:1 which is lesser than the usual; however, it boasts 100,000,000:1 of dynamic contrast ratio which offers a superior relation between the darkest and the brightest color tones. The dynamic contrast ratio, or the Acer Adaptive Contrast Management (ACM) can be manually activated and disabled in the OSD menu. Instead of having to manually go through the OSD settings every time you wish for the higher contrast, you can rely on the pre-calibrated presets which can be toggled via the monitor’s hotkey. The first OSD button on the monitor can be used as a shortcut for navigating between the various scenario modes of the eColor Management feature. This feature optimizes the dynamic contrast ratio in the picture presets, allowing you to enjoy an immersive image quality no matter the content you’re watching on the screen. These picture presets include User, ECO, Standard, Graphic, and Movie modes. The ECO mode saves up to 68% of the power consumption, Graphic mode enhances colors, and the Movie mode emphasizes the details in scenes. When the power LED starts blinking, it indicates that the monitor’s in the standby mode. When working regularly, the power LED shines in an icy blue color. The other three OSD buttons can be used for opening up the menu, and as shortcuts for the Auto Configuration and Change Input Source options. Once in the menu, you will have access to all the common adjustable parameters such as the contrast, brightness, color temperature modes, the OSD timer, and the aspect ratio, among other things. The Acer G226HQL TN panel features a remarkably overall slim design for a budget monitor making it look more expensive. The engaging appearance consists of the glossy black cabinet and the X-shaped base which (intentionally) resembles the Star Wars fighter’s wings. The WLED backlighting is made mercury-free. The monitor can be tilted by -5, +20 degrees although in order to tilt it, you will have to loose the screw at the base of the monitor, adjust the preferred angle, and retighten it back. Unfortunately, the monitor is not VESA mount compatible, so if you wish to place it on the wall or a mounting arm, you will have to buy a fitting adapter. 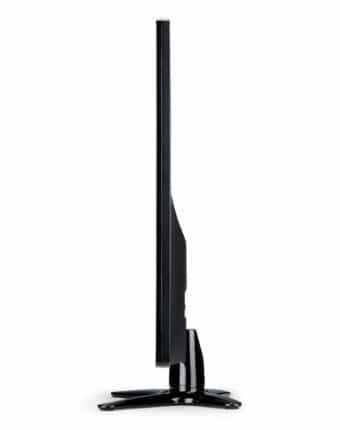 When it comes to the connectivity, the Acer G226HQL monitor features a VGA and a DVI-D port. So, if you wish to connect a gaming console to your monitor, for instance, you will have to purchase a DVI to HDMI converter. Both VGA and DVI cables are provided with the purchase of the monitor. The DVI-D port also supports the HDCP for the viewing of the digital and copy-protected content. 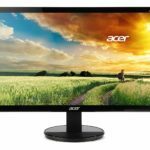 The Acer G226HQL can be yours for only $90 at the moment (May 2017). As previously mentioned, it is one of the most affordable monitors that feature the Full HD 1080p resolution. 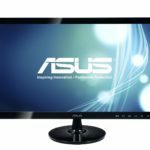 This monitor is also available in several different sizes as well including 19.5, 23, 24, 25, and 27 inches. All of which you can check out at the following links. The Acer G206HQLbd (16:10), the Acer G236HL, the Acer G246HL, the Acer G257HL, and the Acer G6 G276HL display. All of these, except for the 19.5-inch version, are also available with an IPS panel instead of the TN. The Acer G22HQL is the most affordable monitor that offers you the ability to view Full HD digital movies as well as to enjoy responsive, high-quality 1080p gaming. The sleek and slim-bezel design make it appear much more expensive while the X-shaped base will allure the Star Wars fanatics. The mentioned attributes are more than enough at this price point. In addition to that, the stunning contrast ratio makes up for the inferior static contrast ratio and allows you to enjoy well-optimized picture presets which can be easily toggled via the monitor’s hotkey. All of that for under $100! The Acer G22HQL is one of the most affordable monitors that will provide you with the Full HD digital movie watching experience and high-quality 1080p gaming. Moreover, the sleek and modern design makes the monitor look as if it were a lot more expensive.